Who's the hardest person to shop for on your list? If I had to take a wild guess, it's one of the guys in your life, right? Mine is definitely my husband (and my family would agree with me that he is so hard to shop for). And besides the generic "Guys are hard to shop for because they just buy what they want" dilemma, mine is also in the military, which further limits what he needs or wants. This year, I think I've found a great option for one of his gifts--a Philips Norelco Shaver 3100. Since he's military, he has to shave every day, so we go through our fair share of razors anyhow. But with things like field time, electric razors are a big need. The Philips Norelco Shaver 3100 has more minutes per charge, which is awesome when he can't recharge it easily, plus full washable heads and a ComfortCut system, essentials for in the field and great to have at home. Walmart had a great display at the front of our store with all the new Philips Norelco products, so it as easy to find. He is home for Christmas this year, but I'm still reaching back to some of my favorite deployment Christmas boxes for ideas for his Christmas stocking. On deployment, I made sure everything I sent was useful, needed, and tailored to his tastes. I also learned what were the most popular items, so I included those in each box. 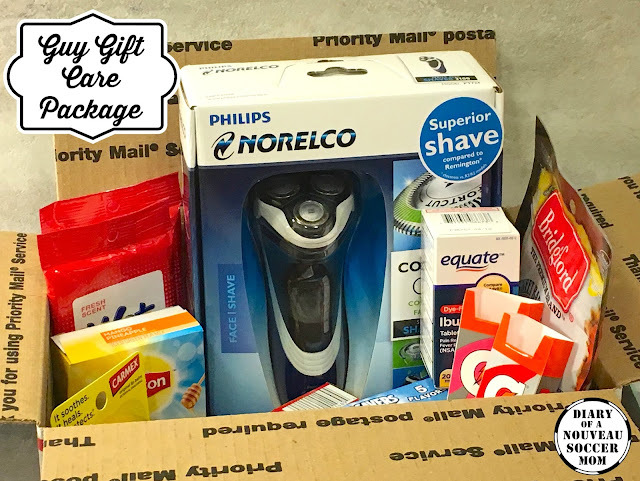 While I'm putting his in his stocking, I also wanted to share our best tips to pack the perfect care package to send overseas. Choose your main gift, or two! Make sure it's something they really need since storage space is at a premium. 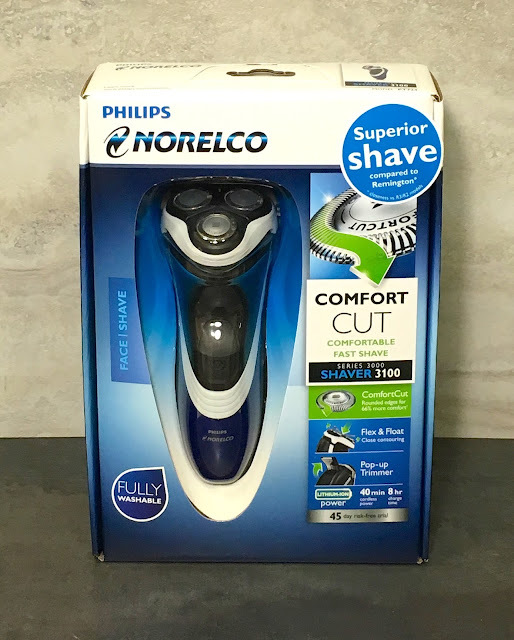 The Philips Norelco Shaver 3100 is perfect--once it's out of the box, it's a great size for storage, and it's definitely a military guy *need*. Pick up a Flat-Rate Priority mail box. This is a must for sending overseas. No matter the weight, as long as the box seals properly, the postage is fixed. Plus some boxes are discounted when you send APO. Start by layering items on the bottom to cushion your main gift, then center your main gift on top of those. Fill the space around it, and make sure to place another cushioning item on top. Fill the extra space in the box with favorite items that don't crush and come in individual packages. Some of my husband's favorites were jerky, gummy candies, red licorice, energy chews, drink mixes, Spam or tuna pouch singles, ramen soup mix, and mini cans of Pringles. Don't forget the toiletries. More husband favorites included chapstick, wet wipes, ibuprofen, small pouches of tissues, and hand sanitizer wipes. Be careful if you pack liquids! I usually only sent liquids in a separate box and with each one bagged individually. Don't send things like shampoo or soaps in the same box as food! Want me to let you in on a little secret? Deployed army guy gift ideas are also really good general guy ideas! It's all the right stuff for sporting events, hunting, outdoorsy-type stuff, you name it. Just take away the shipping box and add some kind of reusable container instead. Maybe a tackle box for fishing or some kind of storage bin/toolbox? A sports team bag or bin? The possibilities are endless and you know the gift will be well-loved. What's your go-to guy gift idea?